We speculate about prices or something else many times on these pages. But when I listening this recording, -actually like many other recordings-, I feel that, we are so lucky because we have these stunning, wonderful, marvellous musics,interpreters and also recording labels.And this music can not measure with money or something else. This is art. Bajazet is a luxurous opera which shines with absolute musical beauty. Yt is also powerful work. Listen, for example, track 11 on first cd, Elina Garanca's "Quel ciglio vezzosetto". Perhaps you shed tears while listening. And such a voice! Thanks to you Mrs.Garanca! And you should admire Marijana Mijanovic' great interpretations. Vivaldi's opera Bajazet tells the same tale of love redeemed by a father's death as Handel's Tamerlane. I'd have to side with the Red Priest on his choice of titles; it's Bajazet, the Ottoman prisoner of Tamerlane, who drives the story. Otherwise, it's a toss-up as to which is the more glorious music, with Handel offering more pathos and Vivaldi more fury. Operas set in the Ottoman Empire were popular in the 18th Century, even in Venice, where the Turks had been feared and hate for hundreds of years. Mozart wrote his Abduction from the Seraglio at the tail end of this enthusiasm for the exotic. An interesting link exists between Vivaldi and Mozart. The role of Idaspe in Bajazet was sung by a young Florentine, Giovanni Manzoli. Idaspe is only a secondary character in the drama, but she is given spectacular muisc to sing in this 'pasticcio'; Vivaldi composed all of her arias especially for this opera, rather than recycling or borrowing arias from other works. Manzoli went on to have a 30-year successful career, and to sing the title role in the Milan debut of the boy Mozart's opera Ascanio in Alba. Another linkage: the role of Tamerlane on this studio recording is sung by countertenor David Daniels. Just recently I heard/saw Daniels sing Tamerlane in Handel's opera, at the Kennedy Center in Washington, with Placido Domingo singing the role of Bajazet. It's tricky to compare a CD with a stage performance, but to my ears Daniels is much more successful in this Vivaldi than he was in the Handel. The problem was the total musical context in Washington, with a mixed cast of Baroque specialists and singers more experienced in Verdi and Puccini, and a modern instrument orchestra. Domingo brought his huge personality to the role of Bajazet and made the tragic figure emotionally potent, but honestly he couldn't navigate the florid 'passagi' typical of Handel's Italian operas. Thank the muses that he didn't attempt Vivaldi! This CD performance features the superb original instrumentation of Europa Galante, led by Fabio Biondi, and a cast of vocal athletes that can toss off Vivaldi's swarming arpeggios with avian grace. 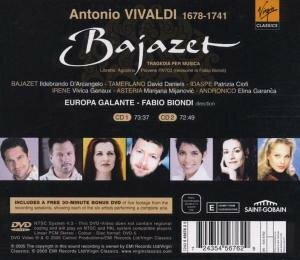 The two-side box of Bajazet comes with a third disk, a DVD of studio footage of the recording sessions, featuring one aria by each of the principals. Honestly, it's a wonderful bonus. CDs of operas are inevitably mere hauntings. Seeing and hearing the characters, even in street clothes with the mikes in their faces, makes the task of assembling all those recitativos and arias into a coherent whole in one's musical mind a good deal easier. Among the singers, for me the stand-out is Vivica Genaux, the mezzo soprano who sings Irene, the jilted fiancee of Tamerlane. In an opera where vocal display is the raison d'etre, Genaux wins the Gold. But there are no disappointments; all six of the principals are impeccable. When I saw Marijana Mijanovic (Asteria) on tv singing the highly provocative aria "Svena, Uccidi, Abbatti, Atterra" I tought to myself "I should definetly own this if it is released on CD." It's been almost a week since I bought it, and now I can easily say that this is the best Baroque opera performance I've ever heard. Everything is so perfect in it; the magnificent playing of the Europa Galante members is delightfuly combined with the amazing singing of one of the best possible group of Baroque opera singers around. The result of this combination is just stunning! Beside the moments of revenge, treason, wrath and anger ("Dov'e La Figla?" "Anche Il Mar par Che Sommerga" "Stringi Le Mie Catene" "E Morto, Si, Tiranno") you will find a number of mild and and hearthbreaking arias ("Sposa, Son Disprezzata", "La Cervetta Timidetta")in this wonderful recording which achieves the true sprit of Baroque Opera. No true music lover should miss this! POWERFULLY TRAGIC AND HIGHLY ROMANTIC DRAMA! In 1734 Vivaldi was made the official impressario of the recently opened 'Teatro Filarmonico' in Verona. It was the first public opera house in that city and it opened its doors performing Vivaldi's 'La fida ninfa'.Entrusted with the task of organising the theatre's 1735 Carnival Season, he programmed 2 of his works with clear political overtones: an ode to Italian freedom with "Adelaide" and a symbolic hymn of resistance against an invader in the shape of 'Bajazet'. The care that Vivaldi lavished on 'Bajazet' can be seen most clearly in the astonishing richness of the recitatives. 'Recitativo secco', which carries the action forward and brings to life the relationships between the characters, was the basis on which Vivaldi's operas rested, and in 'Bajazet', his belief in the primacy of the recitative took him to expressive heights rarely attained by his contemporaries. I have to say that I prefer Handel's Tamerlano for musical reasons. However, Vivaldi's opera on the same subject is very enjoyable and entertaining. Like it has been said of the operas of Haydn, Vivaldi's operas are not great operas, but they do contain great music. Europa Galante, directed from the 1st violin by Fabio Biondi, is in great form and I've never heard them play better. I have their older recording of Handel's opera Poro, and I enjoyed that one, too. The singers here are an excellent ensemble. I like the dark and expressive voice of Ildebrando D'Arcangelo - he was also marvellous as Leporello in Gardiner's Don Giovanni. David Daniels is fantastic, as usual, and he is possibly the best operatic countertenor in the world at the moment. Patrizia Ciofi is best heard and not seen - sweet voice coming from a madwoman (check out the DVD!). Vivica Genaux has been hyped to within a centimetre of her life recently. She has a nice flexible mezzo voice. A little too much vibrato for my tastes and she looks like a chipmunk when she attacks coloratura passages. Marijana Mijanovic sings well - she was excellent as the neurotic Penelope in the Christie / L.A.F. DVD of Monteverdi's Il Ritorno d'Ulisse in patria. She is alarmingly thin - possible health problems? She doesn't engage with the conductor or orchestra at all in the DVD - the only singer who doesn't. Elina Garanca looks beautiful (and healthy!) and sings beautifully. She has a lovely contralto voice. I hope I see and hear more from this artist in the future. I am not a big fan of Vivaldi's operas - I enjoy them as collections of arias. I wonder how well Bajazet worked on stage? I'd love to have a DVD of this production, I would like to see how a Vivaldi opera works on stage. Vivaldi's operas don't have imaginative scorings and the orchestral passages are fairly prosaic. A lot of what goes on in the Vivaldi operas I've heard (I have a few in my CD collection) is pretty routine. However, I am open minded on the subject and I would like to see how well a Vivaldi opera works on stage. I looked forward greatly to this release, having been re-introduced to the joys of Vivaldi's operatic writing through the Naive/Opus recordings, but when it finally arrived I was disappointed. Obviously the problem for a pastizzio is that musicaly it is almost bound to be less cohesive than an opera written by a single composer to a specific libretto. It is difficult for me to know how many of the problems with this recording lie in the score, and how many are due to Biondi as this is the only recording I have heard of this piece. But I found it choppy and dramatically fractured. This recording boasts a number of really wonderful singers--Patrizia Ciofi is stunning, as is Vivica Genaux and Ildebrando D'Arcangelo. Genaux is, however, completely hampered by Biondi's tempo in her aria Qual guerrio in campo armato (by Broschi), which she also sang on her recording Arias for Farinelli. Biondi's continuo group rushes the tempo, constantly pushing, and Genaux, unable to take time to breathe, is forced to break the phrase she can perform quite stunningly at a fractionally slower tempo. It is obvious from the accompanying CD that she is not happy with the performance (her face tells it all). And the break also fractures the musical line. Sure Broschi is not Vivaldi, but there's no reason to insult the music. As for the other singers, they're ok. I expected much more from Biondi after listening to his recently released recording of Alessandro Scarlatti's La Santissima Trinita on which his work is wonderful, but on this recording he disappoints. This is a Bajazet to end all Bajazets and Tamerlanes. The score is first class- Vivaldi wrote some of his most inspired and beautiful music for this one and then wisely borrowed several great pieces from Broschi and others. The story is garbled garbage, but it serves the glorious music just perfect. The orchestra playing has spectacular urgency and flow and all of this is served in a recording of amazing quality- the sound engineers deserve a heap of golden sun medals. The vocal superstars of this recording fire on all cylinders- there's enough energy in the fast arias to power up a small city, while the slow ones are just as intense. The standouts? Hard to pick any, everything is that good, but my favourite at the moment is Garanca's Non ho nel sen costanza; Arcangelo's Dove la figlia and Genaux' Qual guerriero are the most vibrant. Vivica outdoes herself in this aria's ornamentations- the writing is already so dense, it seems impossible to actually put any extra notes in there, yet she does that and how! And all this while taking it at even greater speed that she did on her Arias for Farinelli album and with laser point accuracy. I really did not expect such operatic splendor from Biondi. So far I only associated him with instrumental music, including a horrible rendition of Four Seasons, which I got to know from a most campy music video I saw on TV- it featured a fair maiden in a flowing romantic cloak trashing around a forest, no less- but if Bajazet is a sign of things to come, Biondi and the gang should quit all other gigs and stick to doing as many Baroque operas as possible. Last but not least the fabulous DVD that comes with this release shows the artists hard at work but definitely enjoying themselves immensely in the process; it seems that the arias are not recorded in one take, given that Daniels appears in several different t-shirts in one video, but it's great to see the whole shapely group- Ildebrando looking most fit- going through the workout of some of the more acrobatic pieces. Ciofi does a great face in her video and if we ever had an Oscar for Best Snarl While Doing Impossible Runs, Vivica Genaux would be it. Superlative Cast in a Superlative Baroque Treasure of an Opera! BAJAZET. How many even devoted baroque music lovers have heard (or even heard of!) this curiously obscure Vivaldi opera. The story of the 14th century Tamerlano, a cruel warrior, and the Turkish sultan Bajazet, has been portrayed in many art forms, including Handel's opera 'Tamerlano', but no one got the flavor of the grisly deeds and court intrigues better than Antonio Vivaldi. This recording is a revelation. The opera excels in brilliant arias and cogent recitatives and offers some of the most challenging yet finest singing parts in opera. Fabio Biondi conducts the incandescent Europa Galante with extraordinary attention to detail yet with a pacing that keeps this opera's momentum on exciting edge. The cast is incomparable: Ildebrando D'Archangelo in the title role sings with a richly colored, agile bass-baritone; David Daniels brings his usual countertenor finesse to the role of Tamerlano; Elina Garanca's gorgeous mezzo-soprano voice surveys the tough role of Andronica (originally written for a countertenor): Marijana Mijanovic is a decisive Asteria; the amazingly talented mezzo-soprano Vivica Genaux sings Irene with one of the most facile, exciting coloratura displays on record.